So you're thinking about PS4 Pro deals or maybe a bundle? Well we can most certainly help you out there as we're always checking out the latest sales. Maybe you're upgrading from your older PS4 so you can dive into 4K gaming. Or maybe you've never had a PS4 and are thinking you may as well start with the best. All solid choices, especially if you're already set with a 4K TV, even better if it has HDR too. There are some fantastic-looking games out now to really make a PS4 Pro shine; Red Dead Redemption 2, Spider-Man, God of War, Detroit: Become Human are all serious lookers and jaws are bound to drop further when The Last of Us Part 2 sneaks onto our 4K TVs later this year. You'll find all of the latest and best PS4 Pro prices from the big name stores in our comparison chart below. There's not too much difference in price between retailers at this time of year, but we're constantly on the lookout for the latest deals and bundles. Looking to buy in Australia? You'll want to take a look at our AU page. If you'd prefer a standard PS4, then check out our PS4 bundles (USA) or PS4 deals (UK) pages. Don't forget to top up your subscription with one of our discounted PlayStation Plus deals too. So keep this page bookmarked to stay informed of the latest PS4 Pro bundles when they arrive. If you're looking for more information on the PS4 Pro, take a look at our handy Q&A below the bundles. Worthwhile PS4 Pro bundles have been pretty much non-existent in the US for the last few months. 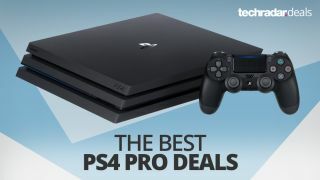 The PS4 Pro on its own has seemingly sold out at the regular $399 price, meaning we've only seen units for sale via third-party sellers on sites like Amazon/Walmart for prices often at least $40 more than usual. This long after release, we're not cool with that you shouldn't be either. As a bare minimum, you want at least one game with the console for $399, ideally less in the next few months. The only decent PS4 Pro bundle today is the Read Dead Redemption 2 one we've just added below, don't expect stock to last long on this one though. If you don't particularly need any games, but just want the lowest solo PS4 Pro price, Walmart is your best shot today. So if you're just after an upgrade from your older PS4, this is a handy offer. If you don't mind waiting though, you could end up getting it with a game for the same price - the Star Wars console above isn't for everyone after all. Amazon has just knocked $20 off this RDR2 PS4 Pro bundle making it the first discount we've seen in some time as stock has been low for the PS4 in general in the US. This bundle has been around for a while, but usually at a much higher price at most stores. Sam's Club is selling the limited edition console with the game for the base price of a regular PS4 Pro, making it one of the best PS4 Pro bundles around. If you don't mind the Star Wars artwork all over the console that is. Cheap Red Dead Redemption 2 prices are incredibly hard to come by, so if you're after a PS4 Pro deal too, this is a great money-saving bundle. At this time of year we're seeing a few retailers trying to get away with charging this price for the console alone, which you certainly want to avoid when there are deals like this to be found. This PS4 Pro bundle sold out at most other stores, but you can still get it at the original discounted price over at Very. PS4 Pros themselves are running low around the world right now too so getting a new free game like Spider-Man is a great deal. If you're buying a PS4 Pro, you'll probably need a cheap PlayStation Plus deal too. PlayStation Plus (aka PS Plus or PS+) allows you to play PS4 games online, along with access to the Instant Game Collection, a bunch of free games for PS4, PS3 and Vita each month. The default price for a year is £40. We've shopped around for you though and found a range of prices. So check out our guide of you want the best PlayStation Plus deals. Essentially, the PS4 Pro is an upgrade of the PS4, rather than a 'next-gen' console. The keywords to take in from the PS4 Pro are 4K and HDR. The new machine will allow game developers to include 4K options in their games, so expect the like of Uncharted 4, Call of Duty: Infinite Warfare, Days Gone, Horizon: Zero Dawn and more to look even better on a 4K TV. HDR, or High Dynamic Range is the other buzzword to be excited about as the PS4 Pro will allow for extra detail to be seen on a range of games and also a wider range of colors not usually displayed by traditional HD TVs. Absolutely. If you're planning on upgrading to a PS4 Pro from an older PS4, all of your games will still work. Not every title will be patched to take advantage of the new 4K/HDR capabilities, but the default upscaling (if you have a 4K TV) will more than likely see some improvement to the visuals and the improved console power may give the frame-rate a boost on some titles. No. This was a surprise if we're honest, especially as both the Xbox One S and Xbox One X consoles do. It's a bit of a gamble for Sony, but at the same time, 4K Blu-rays are very expensive for now and many consumers look to digital services to provide their 4K movies and TV content instead. No, the PS4 Pro will still work on a regular 1080p TV, you won't get the benefits of upscaling or HDR though. You may see a slim amount of extra detail, or frame-rate boost, but we wouldn't expect a massive leap. If you are thinking of buying a 4K TV soon, then it's probably a good idea to splash out on the PS4 Pro instead of the regular or new PS4 Slim as it'll future proof you for a while. Be sure to look out for a TV that supports HDR too, in order to take full advantage of the PS4 Pro's capabilities. Early reports say yes. The PlayStation VR frame-rate is better on PS4 Pro and the resolution gets a bit of a bump too. PlayStation VR will certainly work on the older PS4s, you don't need a PS4 Pro to get involved there. We've dived through our back catalogue of PS4 games that have received a PS4 Pro update patch to see which ones look the best and have a noticeable difference. Take a look at our extensive feature - The best PS4 Pro games.